A fine day with a perfect vista over to the small village Fiskebackskil outside Lysekil at the WestCoast of Sweden. Find below another version of the idyllic coastal village. 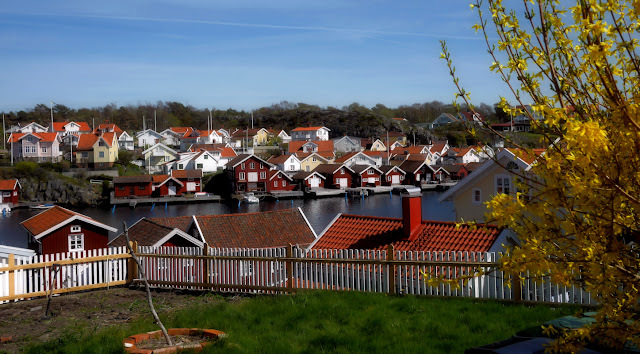 Fiskebäckskil is an old and genuine shipping community with narrow sidestreets and houses decorated with fancy carpentry work. In the middle of the 19th century the inhabitants gave up fishing and became freight-skippers instead. They built themselves big and fine houses and were thus prepared when the seaside resort era started at the turn of the century. Fiskebäckskil became elegant and fashionable and still host many summer inhabitants from our capital. Stroll the town's narrow lines for an hour or two, enjoy the picturesque car-free surroundings and a meal at "Captain Sture", a restaurant with oldfashioned fishing interiors nearby the church (built 1772).